For centuries, farmers have worked to make their fields more productive, usually by relying on trusted rhythms that only occasionally got out of whack. Global warming changes that, with unpredictable seasons and unforeseeable disruptions that demand an increased emphasis on resilience, or the ability to bounce back from external stresses. 29 January 2019 | “How the world deals with large and serious problems is almost certainly going to shape our collective future” is the second line – and a promising start – in this edited Springer volume titled “Rethinking resilience, adaptation and transformation in a time of change”. The volume is edited by Wanglin Yan and Will Galloway, both based in Japan, and many of the contributors were in Japan during the massive disaster that struck the country’s Northern coast in March 2011. The first chapter “understanding change through the lens of resilience”, by the editors, goes through the definitions of resilience, adaptation and transformation, and then looks at how we could move from resilience to transformation. While I appreciate the table on resilience, adaptation and transformation, it is a pity that a few pages further, they limit themselves by putting everything in a figure where adaptation and transformation is only seen as a process. And while the adaptive cycle is discussed, the figure feels rather static and not cyclical. However, they make up for this with an interesting discussion on rethinking change through a resilience lens. Part II Recognizing vulnerability. Chapters 2 to 6 make up part II of the edited volume, which focuses on recognizing vulnerability. Two chapters relate to the triple disaster that hit Japan in March 2011, while other chapters cover vulnerability issues in Tunisia, Brazil and Mongolia. It was the Mongolia chapter (Chapter 6) that touched me the most, discussing the vulnerability of pastoral social-ecological systems, impacted by climate extremes, and how vulnerability has changed, and still is changing during the country’s transition to capitalism. Two self-organizing processes are ongoing, being the migration from rural to urban areas, and the emergency of traditional pastoral networks, where households group together or form communities. Two developing pathways can be recognized in Mongolian rangelands; predominantly private land ownership versus the traditional land-use culture operated by traditional, resilient pastoral networks. It is very interesting to read how this has influenced, and at times limited, their adaptation options. Part III Awareness and preparedness for change. Chapters 7 to 12 focus on how change and disaster are being prepared for, from the local to the global scale. Chapter 10 discusses the development of an international institutional framework for climate adaptation and practice in adaptation planning in developing countries. That development is clearly a work in progress, and my feeling is that we all tend to move too quickly to the next best thing, without properly learning from what we have just introduced… This publication doesn’t even touch upon the Green Climate Fund (GCF), but we tend to move from one fund to the next, to the next, when these existing funds are underfunded and full of exciting proposals that need funding. This means that the governments in receiving countries – who are already spread thin – need to do yet another baseline assessment and rewrite everything to the GCF’s objectives after they just submitted it to the LDCF/SCCF to find out there is little money. Equally, 50+ countries completed their National Adaptation Programme of Action (NAPA), to find little funding for their implementation, now developed their National Adaptation Plans (NAP) – yes, with a longer time horizon, to then find out they now need to come up with Nationally Determined Contributions (NDCs) that also touch upon adaptation… We keep ourselves very busy, but we learn little from the past. Part IV Tools and methods for building resilience. Chapters 13 to 16 focus on ICT-based toolboxes and planning tools for building resilience, ranging from conceptual – what kind of information, and how, do you need to support decisions in sustainable development and a resilient society – to the more practical examples on urban disaster resilience planning. Chapter 16 stood out, because of its focus on ‘swarm planning’, something I had heard of, but I am not familiar with. Swarm planning departs from current spatial planning practice, adjusted on the basis of complexity theory. Problems play over long time-frames and are often seen as ‘wicked’. Spatial planning practice has had difficulties incorporating these characteristics, because these planning systems are generally used to solve rather straightforward and often linear problems. Swarm planning incorporates wicked problem thinking into spatial planning, aiming to develop a plan that is adjustable if need be. “When we allow the urban fabric to adjust dynamically to external shocks, like a swarm of bees does, the city becomes more adaptive”. I like the sound of that! Nevertheless, the urban fabric is made up of people, and – like a hive – extreme events do often result in a significant death toll. And, not to underplay the complexity of bee societies, a bee society has a top-down governance structure where the individuals have one of four roles; queen, nurse, forager, and drone. Reality of the urban environment is a little more complex… Having said that, this chapter is a great read, and at the end I feel like calling up Rob Roggema and Nikolay Popov (the authors) to continue the discussion! “Swarm planning emphasizes the inclusion of complexity, multiple rhythms and non-linear processes of spatial planning.” There is a very interesting case study on an urban renewal project West of Melbourne’s business district. The beauty is not in developing these theories and models, the beauty is in applying them, and this is where it gets really interesting. Urban objects are defined, rules are set for each object based on swarm (bees) and flocking (birds) models, and then it was indicated which objects would remain unchanged and which ones are more dynamic. Rules are added on steering behavior and flocking behavior, to make sure the objects do not get too close to one another and have dynamic behavior. In this way you can mimic how buildings would flock when sea level would rise 4 meters, providing an answer for a flood-safe building area. What I noticed was that only one climatic threat – sea level rise – was included. And the authors in the end point out that with the use of multiple climatic threats (I was thinking of urban heat), the result would be more of a compromise. You also have to keep in mind that the urban environment cannot continuously reconfigure. But a very interesting chapter! Part V Transformation from disaster and crisis. Chapters 17 to 20 focus on the opportunity for transformative change in the aftermath of a disaster. Chapter 17 discusses a case study of Japan’s Awaji island green infrastructure in reconstruction after the 2011 earthquake and tsunami. And what was interesting to me is that they went back to the first maps of 1847 in their analysis of changes in land use. Long term land management in pre-industrial Japan has influenced the reconstruction plans and could inform sustainable land use in the future. Chapters 18 and 19 also focus on Japan in the aftermath of the March 2011 disasters, while Chapter 20 discusses the challenges and opportunities in building resilience in Africa through transformation and a green economy. Providing a good introduction to the African context, this chapter also discusses examples that relate to the food-water-energy nexus. The chapter concludes, among other things, that Africa has all the ingredients for a bright and prosperous future, with a main challenge being institutional capacity and the efficiency of institutions implementing green and smart solutions. Part VI Building resiliency with community. The last four chapters focus on the role of communities, and on how resilient communities are organized. These chapters (especially 21 and 24) resonate with me, given I was involved in the post-tsunami reconstruction effort with the Red Cross in Banda Aceh and North Sumatra, after the December 2004 Indian Ocean earthquake and tsunami. Chapter 21 discusses a community base environmental design approach, empowering local expertise, while Chapter 24 focuses on combining the skills of architects and local expertise in emergency housing implementation. We used a similar approach on a prefab design that is sensitive to the local context when designing and implementing emergency housing in the highlands of Nias Island. There was certainly a lot of learning on the job, and I would have loved to have read these last four chapters before my engagement in that Red Cross job. Still, it worked out well. If the length of a book review is in any way in indicator for a publication’s quality, then yes, it certainly is in this case! 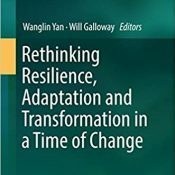 It was a pleasure reading “Rethinking resilience, adaptation and transformation in a time of change”, and – despite its price – I highly recommend this publication to those working in post disaster recovery situations, or interested in the topics of resilience, adaptation and transformation. Dennis Bours is an Adaptation and Resilience M&E Officer at the Global Environment Facility (GEF) – Independent Evaluation Office. He also publishes a weekly online magazine, “M&E and climate change interventions”; a collection of articles and resources on monitoring and evaluation, knowledge management, learning and capacity development in a changing climate. This story first appeared on LinkedIn.